The VapirRise2.0 Ultimate is one of those vaporizers that may not get as much credit as ita really deserves. 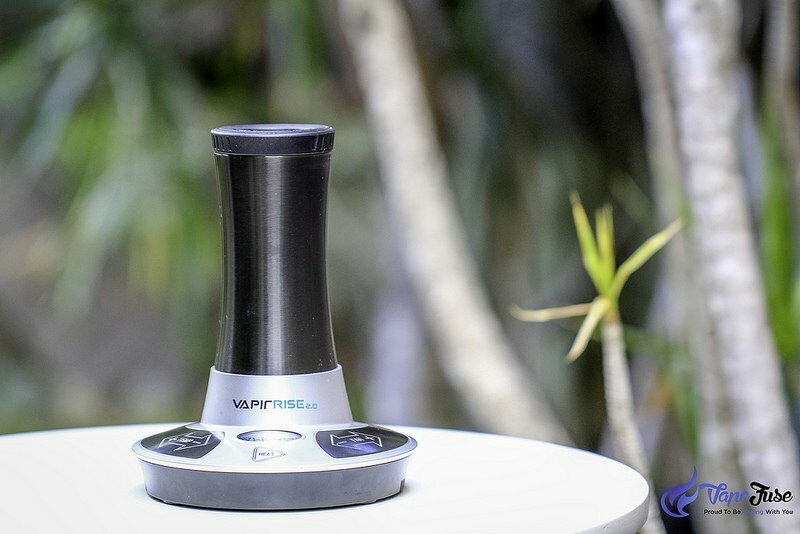 The previous version of this desktop vaporizer wasn’t quite as perfected as the latest 2.0 Ultimate version and many people still haven’t caught up to the new improved VapirRise2.0 Ultimate. This is one of the better-looking desktop vaporizers, that you can just simply leave out in your living room or bedroom. Unboxing the VapirRise2.0 Ultimate is quite an experience. It is packed in a nice printed box and all the parts are stored neatly inside the box. It comes across as a quality device and makes a good impression straight out of the box. 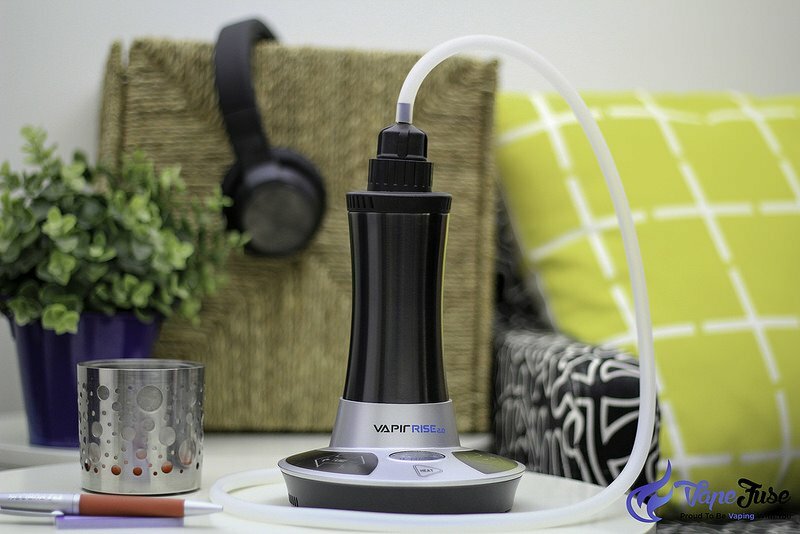 Just like other Vapir vaporizers, the VapirRise2.0 Ultimate is well designed and simple to operate. The round shape body with the touch buttons and nice chrome finish make it a good looking and well-made piece of appliance. The digital display is big enough and easy to read. It did not take me long to figure out how to get started. After a quick read of the user manual, I found it easy to get up and running with the vaporizer. 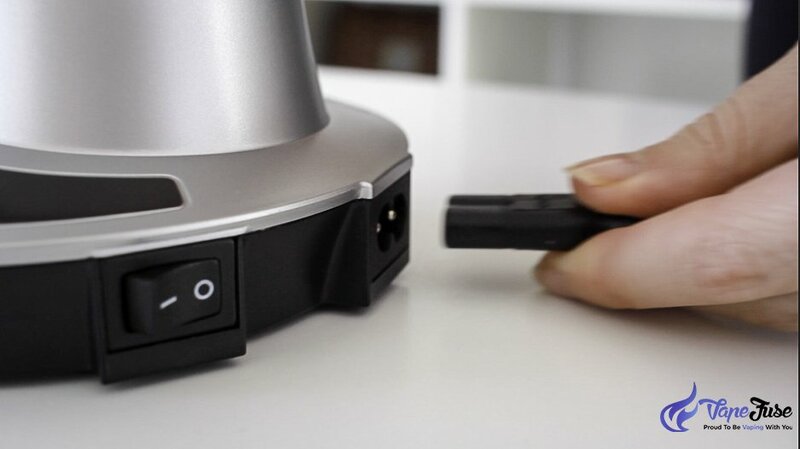 The power cord plugs into the vaporizer at the back, besides the on and off button. You have a + and – button for both the temperature and fan speed as well as a “HEAT” button to turn the heating element on or off. The turn off of the previous version of the VapirRise was that you could not operate the heating chamber without the built in fan running. With the 2.0 Ultimate, you can turn the fan off while your chamber is heating. If you haven’t used the first version of the VapirRise, you may not know what I am talking about. If you have, you’d know exactly how inconvenient it was at times to have the fan constantly running while the heating element was on. This single improvement alone makes the VapirRise2.0 Ultimate an awesome stationary vaporizer. This vaporizer can be used for dried herbs and thick plant based oils, however dry herb vaporizing is the only function I use it for. 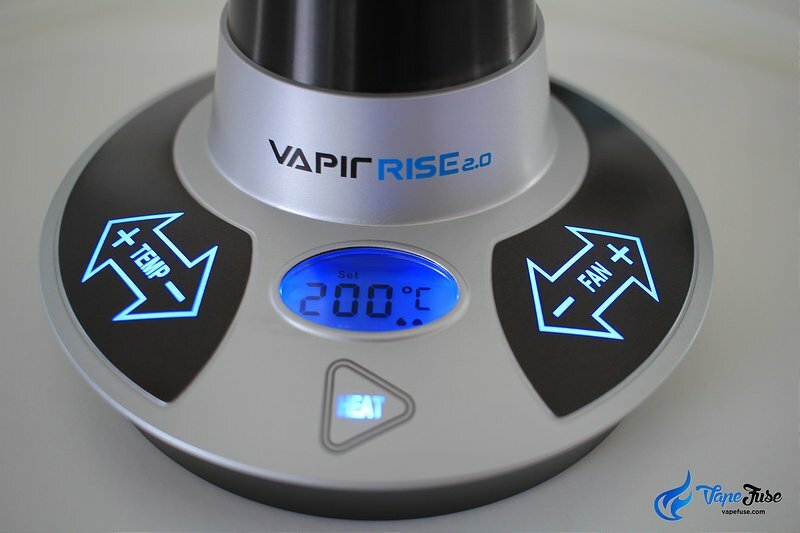 The VapirRise2.0 Ultimate works between the temperature range of 65 to 215 Celsius (150 to 420 Fahrenheit). This enables you to vaporize a wide range of herbs, however, both the Arizer Extreme Q and the Storz and Bickel Volcano go a little higher. Having said that, you’ll rarely need to go above 215 Celsius (420 Fahrenheit). After you set your desired temperature, you need to hit the “HEAT” button right under the digital display. The inbuilt fan will start at the same time as the heating element starts heating as you push the heat button. It starts at level 2, and you just need to press the minus sign on the fan control on the right of the digital display to turn the fan off. The vaporizer heats up very quickly, in about a minute or so. I have only used the dry herb chamber and that I find very convenient. It comes with a decent size dry herb chamber and you can pack it while the vaporizer is heating up. Grind your herbs fine and pack your chamber lightly. The screens in this vaporizer are all drilled plate screens, so they are easy to clean and last for a long time. I also like that it has no breakable parts and how robust this vaporizer is. It is built for everyday use and seems to be very reliable. The chamber clips onto the adapter and it goes straight into the vaporizer, where you can lock it in by twisting it clockwise. One distinctive advantage of the VapirRise2.0 Ultimate over other desktop vaporizers is the multi-user adapter. 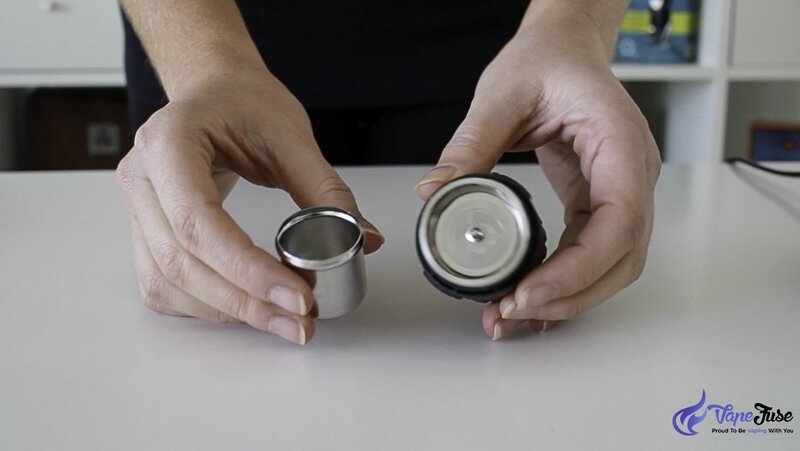 Once you have the adapter (with the chamber attached to it) clicked into the vaporizer, you can place the single user or the multi-user adapter on it. 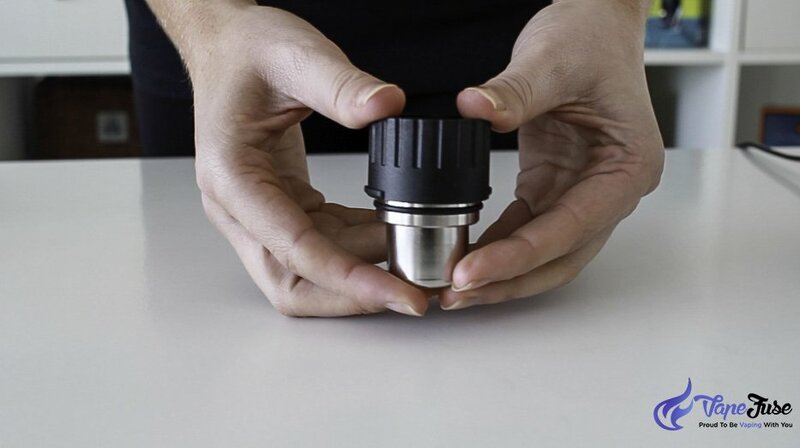 The single user adapter enables you to attach the supplied silicon tube to it and use it as a whip with a mouthpiece or use the tube to fill up a balloon. And now, we are getting to the multi-user adapter. This feature I really like about the VapirRise. The multi-user adapter has 4 outlets and all of them can be turned on and off with a little valve, as you can see below. If you’d like to use one of the tubes as a whip to vape, while the other tube is filling up a balloon, you totally can. Or you can simply have up to 4 people whip vaporizing at the same time. The built-in fan can be set to 9 different speed. The lower speed levels are great for assisted draw when using the whip function and the higher speeds are better for filling up your balloon. I mostly use the VapirRise2.0 Ultimate as a whip vaporizer, I only fill balloons occasionally. The first version of the VapirRise used to have a balloon valve, similar to the Volcano and Zephyr Ion vaporizers. 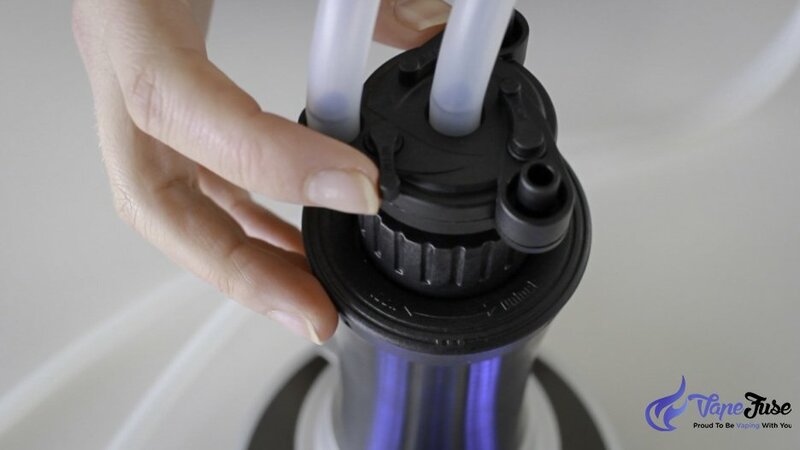 The 2.0 Ultimate version, however, is using a simplified balloon system, when the silicone tube directly squeezes into the balloon and you have a cap on the balloon. I always thought of the VapirRise2.0 as more of a whip vaporizer than a balloon vape. I mainly use my Volcano Digit as a balloon vaporizer while the Rise is my primary whip vaporizer. It is nice to have the balloon function as if there is a bit of vapor left at the end of the session, I can fill up the balloon and come back to finishing it off in 10 -15 minutes. The vaporizer comes with a ‘hot grabber’, that enables you to handle the chamber while it is still hot. Here is how you are supposed to use it. The vaporizer auto shuts off after 20 minutes of use. If you’d like to keep going, just press the heat button. I believe the vapor quality is really good using the whip function. The heating element is ceramic, the heating chamber is stainless steel and the device comes with a HEPA (High-Efficiency Particulate Absorption) air filter. This is a great feature, both, the Volcano and the Zephyr Ion desktop vaporizers also utilise air filters. I find the vapor of the VapirRise great quality, pure and flavorful. Cleaning the VapirRise2.0 Ultimate is reasonably simple. The chambers can be soaked in rubbing alcohol, and the screens can also be wiped with rubbing alcohol to make cleaning easy. The single and multi-user adapters take a little more to clean, however, they also can be wiped with rubbing alcohol and I find them easier to clean than glass parts. 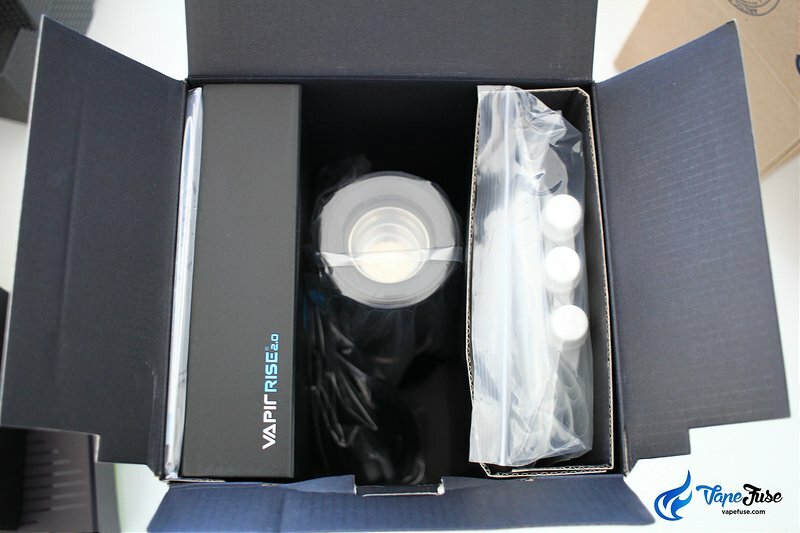 Overall, the VapirRise2.0 Ultimate is fairly easy to clean and maintain. 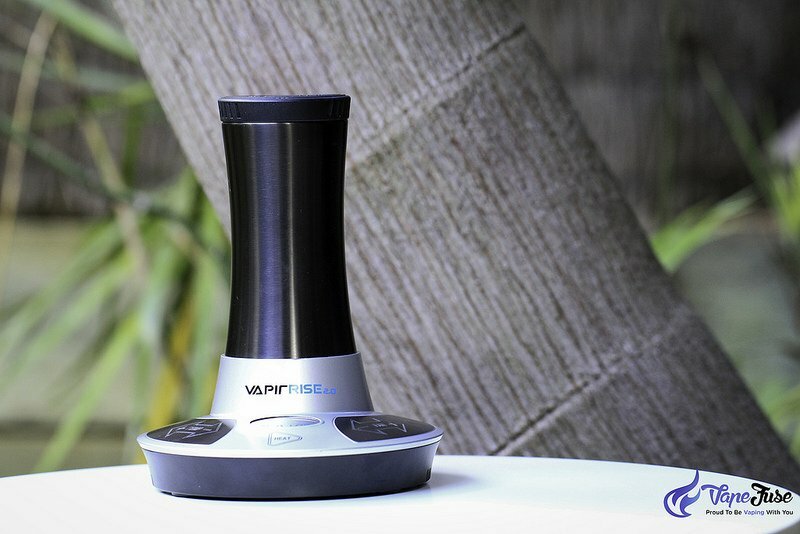 Who is the VapirRise2.0 Ultimate Vaporizer for? It is for anyone that is looking for a well priced, reliable and high-quality desktop vaporizer. There are no delicate glass parts to the VapirRise, so they are surely great for anyone that prefers not to deal with the fragility of the glass components. It is also ideal for anyone that likes to entertain friends and family and likely to have group vaporizing sessions. This is the most fun stationary vaporizer to use with friends. It is perfectly suitable for newbies as well as for long time vapers. I believe the VapirRise2.0 Ultimate is an awesome vaporizer that is easy to use and well suited for everyday use. The Rise has one of the best whip functions with excellent vapor quality. It is robust and durable and looks very good. The VapirRise2.0 Ultimate has developed a fanbase in the VapeFuse community and I am certainly one of them. I consider it as great value for money and I am always happy to use my VapirRise2.0 Ultimate. If you haven’t decided which vaporizer to get, check out our vaping guide for more useful information. Hemp Food Legalisation in Australia for Human Consumption – Will It Go Through This Time?